The CSL fire telephone system has full duplex audio communications to ensure clear conversations in real fire situations regardless of background noise. With emergency battery backup and constant self-monitoring for faults allowing the CSL fire telephone system to meet all project specifications. The master panel is normally located at the main entrance of a building for use primarily by the fire officer and the outstations strategically placed around the building for use by fire marshals or fire brigade personnel. Using the fire protected communication link, personnel can assess the emergency situation and implement the appropriate action. This is particularly desirable in high-rise buildings where an evacuation needs to be coordinated to prevent stairwells becoming overwhelmed. For those executive office areas, a stainless steel option is also available. The plate is designed for flush installations only. Handset colours are available in Red (Shown) or Grey. The fire telephone outstation, Type A. 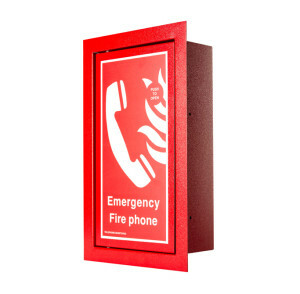 Flush enclosure finished in red leatherette paint with a polycarbonate front label and houses a red handset. Hearing aid t-coil output. By simply lifting the remote handset a call is made automatically to the central control panel. A clear full duplex audio conversation can take place. The fire telephone outstation, Type A. 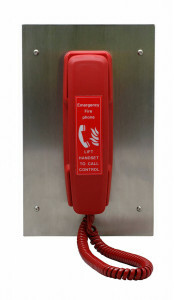 Stainless steel flush enclosure with black screen printed door and red handset. Hearing aid t-coil output. By simply lifting the remote handset a call is made automatically to the central control panel. A clear full duplex audio conversation can take place. The fire telephone outstation, Type A. 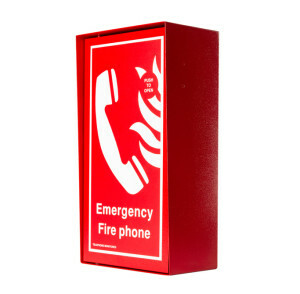 Surface enclosure finished in red leatherette paint with a polycarbonate front label and houses a red handset. Hearing aid t-coil output. By simply lifting the remote handset a call is made automatically to the central control panel. A clear full duplex audio conversation can take place. Combined disabled refuge and fire telephone unit. Type A and B. 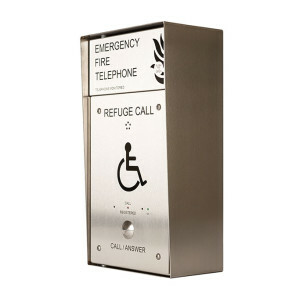 Flush enclosure finished in stainless steel, black screen print, and stainless steel disabled refuge outstation combined into the door. Housing a red handset with earing aid t-coil output. By simply lifting the remote handset or pressing the disabled refuge call button a call is made automatically to the central control panel. A clear full duplex audio conversation can take place. Combined disabled refuge and fire telephone unit. Type A and B. 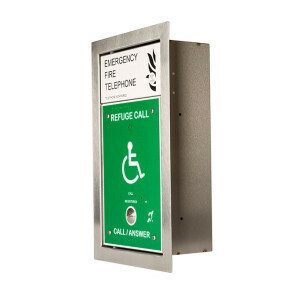 Flush enclosure finished in stainless steel, black screen print, and green disabled refuge outstation combined into the door. Housing a red handset with earing aid t-coil output and a full induction loop output from the disabled refuge unit. By simply lifting the remote handset or pressing the disabled refuge call button a call is made automatically to the central control panel. A clear full duplex audio conversation can take place. Combined disabled refuge and fire telephone unit. Type A and B. 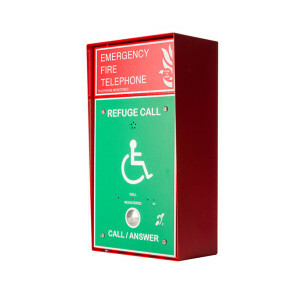 Surface enclosure finished in red leatherette paint with a polycarbonate front label and a green disabled refuge outstation combined into the door. Housing a red handset with earing aid t-coil output and a full induction loop output from the disabled refuge unit. By simply lifting the remote handset or pressing the disabled refuge call button a call is made automatically to the central control panel. A clear full duplex audio conversation can take place. 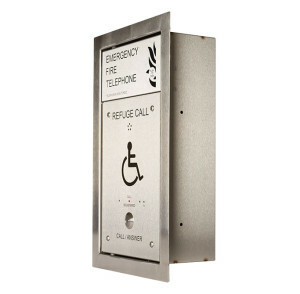 Combined disabled refuge and fire telephone unit. Type A and B. 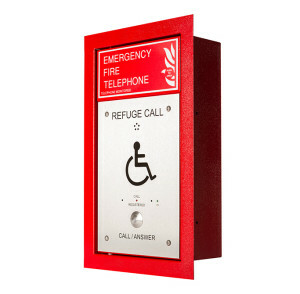 Flush enclosure finished in red leatherette paint with a polycarbonate front label and a green disabled refuge outstation combined into the door. Housing a red handset with earing aid t-coil output and a full induction loop output from the disabled refuge unit. By simply lifting the remote handset or pressing the disabled refuge call button a call is made automatically to the central control panel. A clear full duplex audio conversation can take place. Combined disabled refuge and fire telephone unit. Type A and B. Surface enclosure finished in red leatherette paint with a polycarbonate front label and a stainless steel disabled refuge outstation combined into the door. Housing a red handset with earing aid t-coil output. By simply lifting the remote handset or pressing the disabled refuge call button a call is made automatically to the central control panel. A clear full duplex audio conversation can take place. Combined disabled refuge and fire telephone unit. Type A and B. 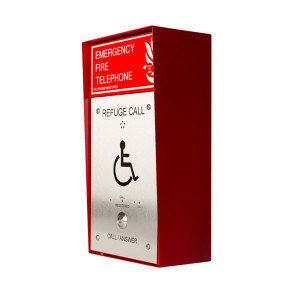 Flush enclosure finished in red leatherette paint with a polycarbonate front label and a stainless steel disabled refuge outstation combined into the door. Housing a red handset with earing aid t-coil output. By simply lifting the remote handset or pressing the disabled refuge call button a call is made automatically to the central control panel. A clear full duplex audio conversation can take place. 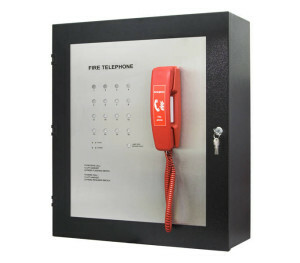 The LS16 is a sixteen way fire telephone system. Stainless steel surface enclosure. The master panel can answer or call out by pressing the seperate call switches and indications for each fire telephone location. Group call can also be selected. Once connected a clear full duplex audio conversation can take place. The call is ended by replacing the master handset. The system outstations are radial wired ‘2’ core ‘1.5’mm enhanced fire rated cable. A volt free changeover contact is provided for remote call in and fault reporting. 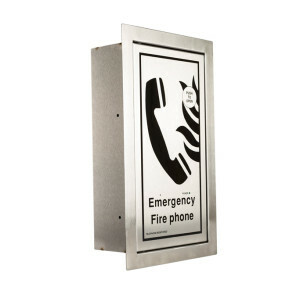 A fire panel inhibit input is also fitted as standard. Battery support 24 + 3 hours. Fully compliant to BS5839 Pt9 and CE 2012 certified. 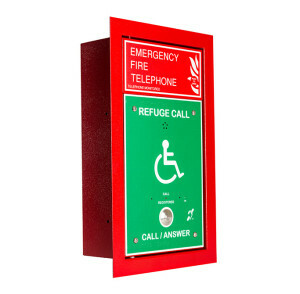 Combined disabled refuge and fire telephone unit. Type A and B. 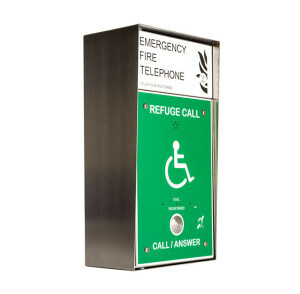 Surface enclosure finished in stainless steel, black screen print, and green disabled refuge outstation combined into the door. Housing a red handset with earing aid t-coil output and a full induction loop output from the disabled refuge unit. By simply lifting the remote handset or pressing the disabled refuge call button a call is made automatically to the central control panel. A clear full duplex audio conversation can take place. The fire telephone outstation, Type A. 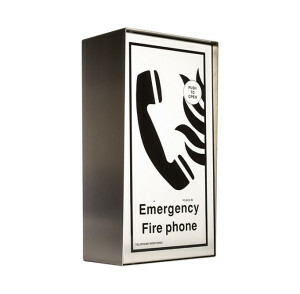 Stainless steel surface enclosure with black screen printed door and red handset. Hearing aid t-coil output. By simply lifting the remote handset a call is made automatically to the central control panel. A clear full duplex audio conversation can take place.